The treated tap water supplied to our homes can still contain some impurities and some bad taste due to the chemicals such as chlorine used during the treatment. Reverse Osmosis (RO) filtering systems can be used to filter up to 99% of the impurities and contaminants. RO filtering is achieved when the water to be filtered is pushed through a special, semi-permeable membrane with ultra small pores (from 0.001 to 0.00001 micron). The membrane allows only clean water to pass through, filtering most of the impurities and contaminants. With RO systems, very high filtering specifications can be achieved. RO-CTOP by APEC WATER that connects to your faucet and does not require any other installation or any electrical connection. ZIP by PuricomUSA that is a self-contained unit that requires zero installation and just needs to be plugged. Selected Countertop Reverse Osmosis Water Filtering Systems on Amazon. This is a light and compact system that was designed to offer excellent portability, convenience and ease of use. It hooks up easily to most types of existing standard faucets in seconds. Aside from connecting the water input hose to your faucet no installation is required. It is perfect for apartments, condominiums, motor homes, retirement homes and students. At 60 psi water pressure, it takes about 15 minutes to obtain a gallon of filtered water. This is equivalent to about 90GDP (Gallons Per Day) of bottled-water-quality, safe drinking water that you can fill any type of water storage container. The whole system weighs no more than 7 pounds and therefore it is very convenient to take with you when you travel. 1st stage: Premium Quick-Connect 5-micron sediment filter which removes dust, particles, and rust. It also protects and extends the life of the membrane. 2nd stage: Premium Quick-Connect coconut shell activated carbon filter which gets rid of unpleasant chlorine, odors, cloudiness, and colors. It also removes VOCs (Volatile Organic Chemicals) and other common chemicals from the water. 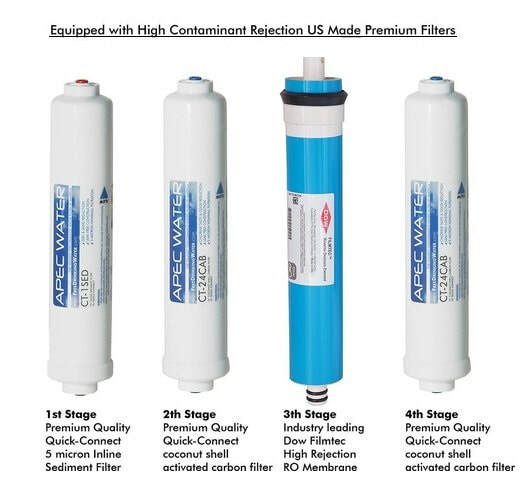 3rd stage: Select FILMTEC (Dow Chemical) High Rejection Reverse Osmosis membrane which removes up to 99% of total dissolved solids and contaminants such as arsenic, lead, fluoride, chromium, radium, bacteria, viruses and much more. 4th stage: Premium Quick-Connect coconut shell activated carbon filter which removes any possible residual tastes. Note that APEC Water has 20 years of successful experience in creating the finest water filtration systems from their California facility. All APEC Reverse Osmosis systems are designed, engineered, assembled, and tested in-house using high-quality parts to ensure that a trouble-free system arrives at your door. Their superior engineering, design expertise, and attention to details have earned their products the distinction of being one of the most durable water-filtration systems on the market. If you are looking for an attractive and portable countertop Reverse Osmosis water filtering system that will look great in your kitchen, requiring no installation at all, and that will produce in minutes a fresh supply of safe, pure, alkaline and great tasting water, you might want to consider ZIP by PuricomUSA. ZlP's innovative patented design has all the features of a traditional Reverse Osmosis filter system in a convenient and stylish countertop and portable case. The booster pump, prefilter, carbon filter, Reverse Osmosis membrane and post filter are all contained in a compact unit that gives you 50% space savings compared to traditional, bulky, Reverse Osmosis filters. With ZIP, you just need to plug the unit, fill up the bottom container with tap water, push the button and walk away. In about 20 minutes, the top container will be filled with purified water, and the unit will turn itself off. This unit can produce up to 75GPD (Gallons Per Day) of purified water. With ZIP, there are no leaky diverter valves or bulky hoses to attach to your faucet. Note that the top and bottom containers are BPA free and can be easily removed and cleaned with dish soap. The unit is 9.5 inches wide, 14.5 inches deep and 16.25 inches high and is easily portable. Therefore, it is also perfect for students, renters and RV owners, as they can easily take it with them wherever they go. Energy wise ZIP is very efficient as it uses only 24W of power which is less than what is used by a regular light bulb, and it has 50% (1:1) recovery rate – best among reverse osmosis filters. For outdoor use, it can be operated from a car's cigarette lighter (12V power plug). Stage 1 is a 5-micron sediment filter which removes dust, particles, and rust. Stage 2 is activated carbon block filter which eliminates chlorine, odors, cloudiness, and colors. Stage 3 is the heart of the Reverse Osmosis system, the RO membrane. It will remove a minimum of 96% of organic contaminants and chemicals from the water. These include pesticides and herbicides (such as DBCP), industrial chemicals (such as PCBs, THMs, TCE), heavy metals (such as lead, copper, zinc, arsenic), fluoride, nitrates, and other organics. Stage 4 is a high quality alkaline post filter. It returns beneficial minerals such as calcium and magnesium to water and increases water Ph to alkaline level. PuricomUSA warrants to the customer that all ZIP Reverse Osmosis units will be free from defects in material and workmanship under normal use and service for a period of 1 year. The product comes with a 1-Year money back warranty. So which Filtering and Purification System should you get? 1. If you are looking for a stylish unit that will look very nice in your kitchen, then you should consider ZIP which looks like an upscale and attractive coffee maker. 2. ZIP by PuricomUSA requires no connections or installations and is completely portable anywhere you go. RO-CTOP by APEC WATER must be connected to a standard faucet. Note that pull-out faucets, special size designer faucets and sprayer faucet are not compatible. 3. RO-CTOP by APEC WATER does not require to be plugged. While ZIP needs to be plugged, it uses less power than a regular light bulb and can be run by connecting it to your car's or RV's cigarette lighter. 4. ZIP by PuricomUSA is also equipped with a high quality alkaline post filter which returns beneficial minerals such as calcium and magnesium to water and increases water Ph to alkaline level. 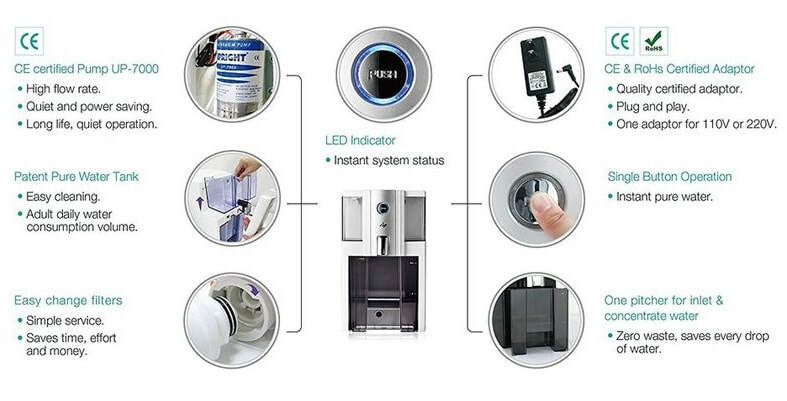 Though ZIP is more expensive than the APEC WATER filtering system, if you can afford it, you should definitely consider it, as you will be very pleased with the way it looks, the zero installation requirement, and the taste of the alkaline filtered water obtained. However, if you can not afford ZIP, the APEC WATER RO filtering system is definitely an excellent alternative as long as your kitchen is equipped with a standard faucet. But no matter which of these two systems you select, you will be able to enjoy unlimited ultra-fresh, great tasting, clean and safe water right at home for both drinking and cooking. You will also be able to save money by avoiding the hassle of buying costly bottled water.